is the world’s largest free mind map library founded by Liam Hughes, UK. On January 1, 2013 I created a new group on Biggerplate.com named APPLE. The Apple group offers free mind maps about Apple products, the operating system iOS for mobile devices, and apps from Apple’s App Store. To download mind maps from Biggerplate you have to register first. Just enter your E-Mail address and a password and you will become a member. The membership is totally free. You can download any mind map created by more than 40,000 members for free. For the Apple group it’s recommended to use the app iThoughts by Craig Scott available at Apple’s App Store. It’s the only app supporting about 20 different formats especially .mmap files (Mindmanager), .xmind files (XMind), and .cdmz files (ConceptDraw) which are supported by Biggerplate. 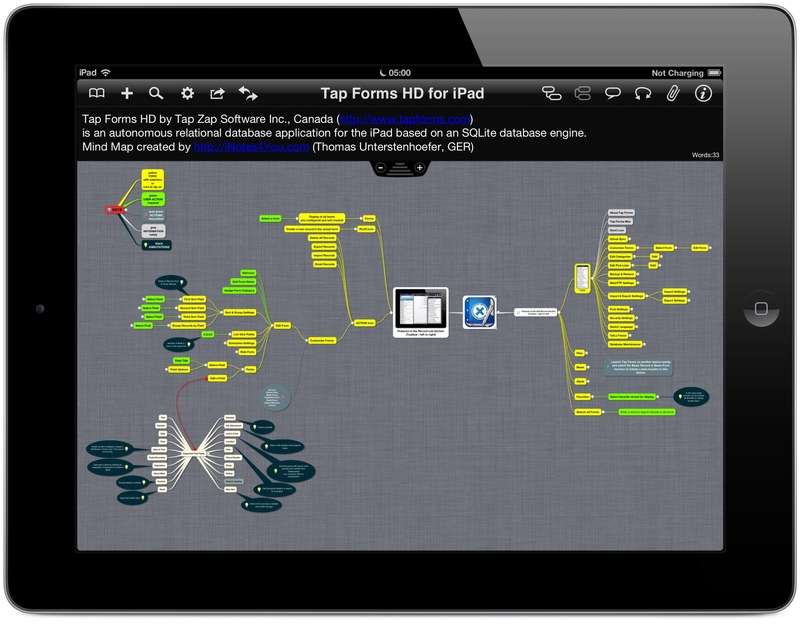 The latest mind map uploaded to Biggerplate within the Apple group is a full feature description of the database app Tap Forms HD by Tap Zap Software Inc., Canada. It’s an autonomous app for database creation that means, you don’t need a Mac/PC to create your own database. Tap Forms supports iCloud and Dropbox as well as Backup+Restore using a ZIP file format. to download the mind maps you are interested in. Liam and Thomas would highly appreciate if you upload your own mind maps related to Apple products. If you have any questions about the app iThoughts or the platform Biggerplate don’t hesitate to contact me via the contact form on my About page.